The science says what it says and that's all. Science doesn't prove or disprove anything with regards to spiritual matters. It can't measure them. Science doesn't prove or disprove God. Science doesn't address the existence of God or matters of faith. Personal experience and sharing it with others is where that comes from. Gathering together, prayer, meditation, etc. The only use science has is measuring the effects of the experiences, if you want to do that. All science has done here is measure a real electromagnetic phenomenon in the same way it can measure the mains voltage in your house. It's people that have linked the non-rising Schumann resonance with spiritual stuff. As you say, science doesn't address matters of belief. But it's good sometimes at unravelling incorrect beliefs, as it clearly has done in this case. That's why science seen as a threat, because it can unravel ideas and beliefs. Of course scientists can be as dogmatic as any other human. Dialogue and understanding are always paramount, imo. I believe that magic as such is happening, magic in that we evolve to timelines, imo this is observable and been observed the last 15 years I have been observing, especially the last 7 years. Of course the old saying that magic is just science not known as yet, I firmly believe. I also believe magic is about natural forces. Science could maybe explain it, but for human dogma. Magic is just phenomenon we don't understand yet.. it's a term of belief/faith. I'm a bit more grounded. I believe in "magic" because if I shift my perspective, how we live now, when viewed from 500 years ago; is very "magical". The hutcheson effect could be considered magic (especially since the guy doesn't even really know what he's doing... haha; uncontrolled magic!). To the average person electricity is just common day magic, most people are pretty clueless about electricity.. even electricians... go a head and ask one how a transformer works... if you read the definition or hear it explained, we don't really know; we just know it does!.. .I have a theory that involves manipulating the magnetic vortexes to change voltage (the more wraps the "smaller and faster" the vortex, less wraps does the opposite.. this would explain the "step up" and "step down" terms). But electricity is so normalized in our society we don't see it as "magic" or special at all. I think the entire "magic" meme can be detrimental... it makes us look for some fantastic fire ball or bang or flash when in reality things are normally more subtle & you have to pay close attention to notice them. Last edited by TargeT, 15th May 2017 at 14:19. I like that...I mean the way you said that! When the British inventor Sir W. Siemens climbed to the summit of the Great Pyramid he found his body discharging sparks as if he were standing on a high-voltage coil. In fact, the atmospheric voltage on the Giza has been measured at 500 per vertical meter, and Siemens should he credited for discovering what Pyramid Power is all about. The goal of Heyerdahl's first expedition was Easter Island (also known for manifesting very high electromagnetic potentials), the farthest east of a group of South Pacific islands where the pyramids of another prehistoric civilization have been found. And like the Egyptians, the aboriginal people of this region called themselves Children of the Sun. The South Pacific is at the antipodes - 180 degrees from the Nile Delta. In America, from the Great City of the Sun at prehistoric Cuzco to the Great Pyramid of the Sun at Teotihuacan, a third great-pyramid civilization arose. This culture ranged along an arc 120 degrees from Giza. A quarter of the way around the world, 90 degrees in the other direction from Giza, recent archaeological digs have uncovered the greatest pyramids known - a thousand feet on a side - buried in the jungles of southern China, and thought to be natural mountains until the overgrowth was cut away. These mountains are the ancestral homelands of the Japanese, who still believe they are Children of the Sun. The meaning of this peculiar dispersion was revealed by accident during the early days of World War II. At that time, radar spotters picked up the echoes of distant aircraft by listening through giant earphones instead of watching blips on flourescent screens, as is done today. The crews frequently reported hearing whistles of no known cause. Eventually, research reported in Scientific American found an ionized layer in the upper atmosphere that filters radio waves selectively in the 7.5-cycle-per-second band, and apparently reflects them back to Earth, bringing them to a focus at the antipodes. When lightning strikes, a broad band of radio waves is emitted, to be heard as static in unfiltered radio sets. The 7.5-cycle-per-second band is filtered from lightning discharging at the other side of the world and brought by the Schumann Layer to a focus 180 degrees distant, where the radar spotters heard the filtered static as whistles. To military engineers, the 7.5-cycle-per-second frequency possesse two properties of great value. The Schumann Layer guides this wavelength all around the world without losing signal strength, like light between two mirror. This wavelength also penetrates water. The United States Navy realized that this was the frequency needed to keep in constant communication with its nuclear submarine fleet, constantly ranging beneath the surface of the world's oceans, and so it constructed a worldwide radio network broadcasting on the 7.5 Hz band, called the Sanguine Project - later extended for civilian shipping as the Omega Navigation System. The striking property of the 7.5-cycle-per-second radio wave is that it is exactly 25,000 miles long. A wave broadcast at this frequency will expand in a growing circle until it is as long around as the equator, and then contract until it cones to a focus at the antipodes. At the other side of the world, it reverses phase and direction, expanding again to girdle the globe before returning to another focus at its exact point of origin. The loop of this wave arrives at its point of origin exactly in time to coincide with its own following wave. This means that only a single wave exists at any time, and that the wave encompasses the whole world. The entire planet beats electromagnetically at this frequency, like a cosmic heart. The 7.5-cycle-per-second frequency is the fundamental period of surface resonance of the global crystal. Resonance in the Schumann Layer means that overtones will be generated at one half the fundamental frequency, one third the fundamental frequency, and one fourth the fundamental frequency, and so on, in successive fractions. The length of the second harmonic overtone is one half the diameter of the Earth, the third harmonic overtone is one third the diameter of the Earth, and the fourth harmonic is one fourth the diameter of the Earth. The pyramid civilization of the South Pacific is halfway around the world from the Nile Delta, the pyramid civilization of America is a third of the way around the world from the Nile Delta, and the forgotten pyramid civilization of prehistoric China is a quarter of the way around the world from the Nile. 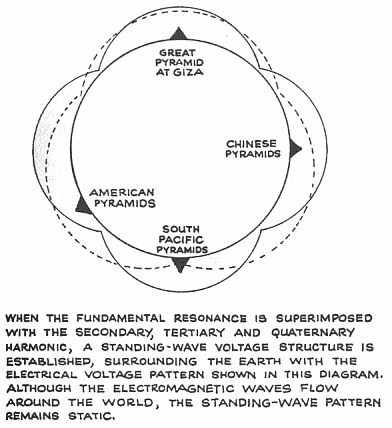 The great pyramids of the world are located precisely at the places where the strongest electrical potential is concentrated on the Earth, and at the loops of the harmonic standing waves surrounding the Earth. The Schumann Layer functions as a radio loudspeaker with its diaphragm enclosing the entire planet. The great pyramids of antiquity are a virtual duplication of the modern military radio-communications network, broadcasting on the 7.5 Hz band from the main transmission tower on the Giza Plateau, with studios and executive offices in beautiful downtown Memphis. In Mysteries of the Great Pyramid, Peter Tompkins reports that all the great cities of prehistory were built up around a central pyramid, and each was located at an exact degree interval from the Great Pyramid at Giza. Now, when settlers are founding a city, their prime considerations are the availability of food, water, defense and trade. Why would a location at a precise degree interval from the Great Pvramid on the Nile Delta be more important? Well, no civilized city can endure without communications. Well there are some misconceptions and confusions in the above article. 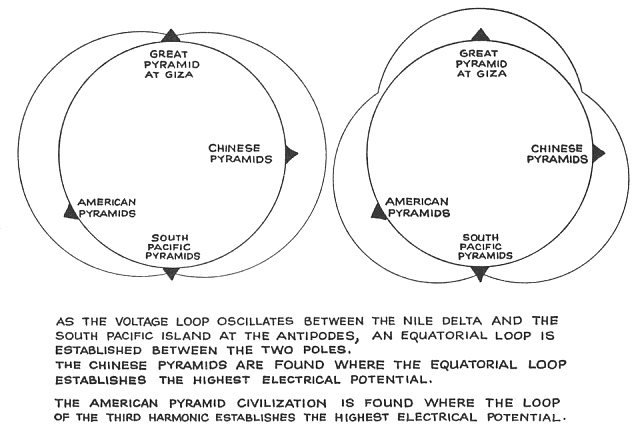 1) Where is Easter Island shown to be "manifesting very high electromagnetic potentials"? In any case, electromagnetism doesn't have a potential. That's voltage. No ham radio expeditions to Easter Island have ever reported any unusual EM phenomenon. 2) Acoustic tracking of aircraft was done in WW1 at Orford Ness I believe with large concrete 'ears'. A frequency of 7.5 Hz would not be perceived as a 'whistle', in fact the mechanics of the human ear means it cannot detect sound below about 15 to 20Hz. 3) The Schumann resonance is not acoustic it's electromagnetic (ie not sound). This article seems to conflate sound and EM waves. 4) The wavelength of 7.5 Hz is not "exactly 25,000 miles", it is rather less: 300,000,000/7.5 = 40,000km = 24,854 miles but in any case the SR varies between about 7.5 and 8.2 Hz depending on the height of the ionosphere. But this is approximately the Earth's circumference so that's why the Schumann resonance is what it is. 5) Overtones are multiples of frequency (harmonics) not fractions. The multiples can be seen on various SR charts, showing 7.8-ish, 15.6-ish, 23.4-ish etc. Sub-harmonics don't exist in this case, or if they do I'd like to see the evidence. 6) Indeed the Sanguine Project did investigate VLF communications at 45Hz and above. But very low frequencies means very low data rates. And in any case it is extremely difficult to transmit signals at these frequencies, the laws of physics gets in the way. 7) The author introducing pyramids into the discussion isn't useful. I have seen no evidence of them having any effect on or creation of electromagnetic signals. If I have missed it, I'd very much like to see it, with the calibrated tests gear shown and results tabulated. 7) The author introducing pyramids into the discussion isn't useful. I have seen no evidence of them having any effect on or creating of electromagnetic signals. If I have missed it, I'd very much like to see it, with the calibrated tests gear shown and results tabulated. While I agree with everything else you've written in that post — and I personally value your technical/scientific insights — I must beg to differ here, and it is very easy to test this yourself. My dad's elder brother was very much into new age stuff, and upon his recommendation, my dad built a pyramid out of thick plywood, with four equilateral triangles as sides — this was either 1980 or 1981, as we had just moved to the new house. As per my uncle's recommendation, we aligned the base of the pyramid to the magnetic north-south axis — i.e. the sides of the base must run parallel with the north-south and west-east axis — and we let it sit there for a whole day. The next day, when we held the compass that we had used for aligning it right above the top of the pyramid, the needle went berserk and started spinning rapidly — I'm not sure anymore but I think it was clockwise, at about three to four rotations per second. 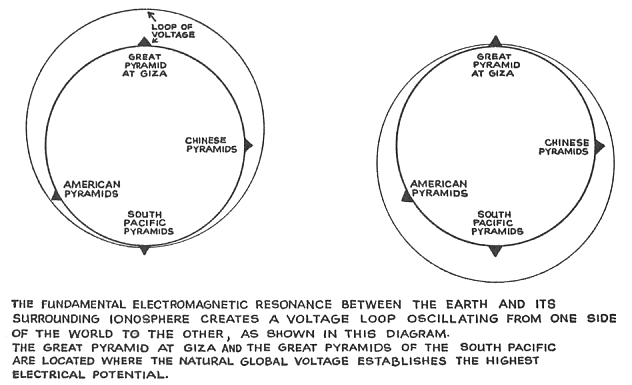 So there has to be some electromagnetic factor involved, and my guess is that pyramids are energy transformers, possibly transforming cosmic radiation (or perhaps even zero-point energy) into a magnetic vortex. Also, from what I've either read or heard, the Egyptian government has already long known about this force and explicitly forbids any and all aircraft from flying over the pyramids out of fear that their instrumentation would go berserk and that the aircraft would crash. 4) The wavelength of 7.5 Hz is not exactly 25,000 miles, it is rather less: 300,000,000/7.5 = 40,000km = 24,854 miles but in any case the SR varies between about 7.5 and 8.2 Hz depending on the height of the ionosphere. But this is about the Earth's circumference so that's why the Schumann resonance is what it is. 6) Indeed the Sanguine Project did investigate VLF communications at 45Hz and above. But very low frequencies means every low data rates. And in any case it is extremely difficult to transmit signals at these frequencies the laws of physics gets in the way. Lyall Watson wrote in his book "Supernature" 1973 (pp 97-100) of the properties of the pyramid. Using for example a small cardboard model aligned N-S as you describe to keep razorblades sharp. I believe he even said polystyrene versions were sold in Eastern Europe for this task as razor blades were always in short supply! I made one of these cardboard pyramids and it had no more magnetic/electric/electromagnetic properties that the adjacent control object - an empty chocolate box of similar size. If such magnetic anomalies as you describe were common, it would be easily demonstrated as "A Weird Thing" in any lab or workshop. Regarding flights being diverted away from the pyramids, well I've flown right over them coming in to land at Cairo Airport from Port Sudan. I've also asked a friend who works for British Airways (not a pilot, but he knows plenty, and is interested in the esoteric) and neither he nor pilots he knows have ever mentioned such a restriction. If there is or ever was one, could it be to not disturb a valuable tourist asset? Although at cruising altitude that won't be an issue. Last edited by Barbarella, 17th May 2017 at 17:40. Lyall Watson wrote in his book "Supernature" 1973 (pp 97-100) of the properties of the pyramid. Using for example a small cardboard model aligned as you describe to keep razorblades sharp. I believe he even said polystyrene versions were sold in Eastern Europe for this task as razor blades were always in short supply! Yes, that is one of the stories my uncle told us. Well, all I can tell you is that it definitely did weird things when my dad built it, out of plywood. But it was perfectly aligned to the north-south axis, and it had been standing there for 24 hours before we tested it. I also told this story to a friend — she is also a member here, but she doesn't log on all that often — and she did the same thing with a pyramid that she has, but I don't know what it's made of. It may be a kind of glass or crystal. Either way, it did work for her as well. She tested it with a compass, just as I had recommended. I'm not sure whether geolocation has anything to do with it — as in "you have to be at a certain location on Earth's energy grid" — but the alignment with the magnetic north-south (or west-east) axis is paramount, and you must give it enough time to "charge". Regarding flights being diverted away from the pyramids, Well I've flown right over them coming in to land at Cairo Airport from Port Sudan. I've also asked a friend who works for British Airways (not a pilot, but knows plenty, and interested in the esoteric) and neither he nor pilots he knows have ever mentioned such a restriction. If there is or ever was one, could it not just be to not disturb a valuable tourist asset? Although at cruising altitude that won't be an issue. Well, okay, that may have been a rumor then, and I can imagine that for low-flying aircraft such as helicopters and single- or twin-engined privately owned airplanes, the preservation of the tourist attraction factor may indeed have come into play. All I know is what I've seen with my own eyes, and what my friend has also witnessed with her own pyramid after I gave her the instructions on how to set it up. Pyramid power is real...the question is this...are the pyramids working properly at the moment? I only have empirical knowledge with the power. I have been part of a project of building one as well (5m tall), and sat in it with me at the most potent point of 1/3 from the bottom. I sat there for about 1/2 hour and after that I was hyper in the most positive way for hours...I worked joyfully for hours after that. Mind you, I didn't sit on the apex. I guess the experiences people have are theirs alone...if you want to find negatives...they are always there. Always. How big, and what region of the globe was it in? anecdotal stories like that are interesting, but ultimately not overly helpful unless the experience can be repeated.. I have a bit of room on my property, I'm willing to build a pyramid and test it out (unless it was like 40 feet tall or something crazy).